On our very first episode we discuss two seminal Christmas classics from the tail-end of the 1980’s, Die Hard and Lethal Weapon! Mike is watching them both for the first time…as for Brandon and I, we’ve seen them both many, many times. Poster for Die Hard (1988), starring Bruce Willis, directed by John McTiernan. Die Hard (1987) stars Bruce Willis as Detective John McClane, a New York City cop who is in LA for Christmas to try and win back his wife Holly (Bonnie Bedelia) who has taken a job with the Nakitomi Corporation. 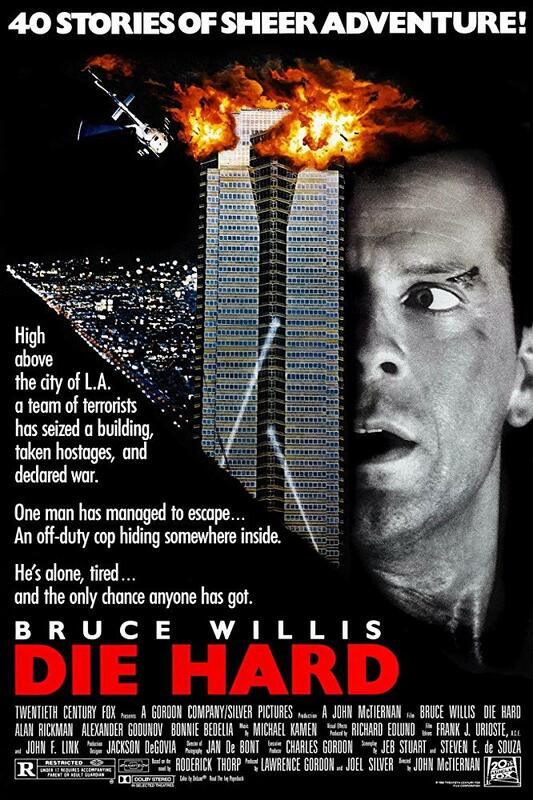 Their reunion is violently derailed when a group of terrorists, led by Hans Gruber (Alan Rickman), take the Nakitomi skyscraper in downtown Los Angeles hostage during the company’s annual Christmas party. This leaves John on his own to outwit and elude the terrorists to try and find a way to stop them before their sinister plans can be completed. Bruce Willis as John McClane. Bonnie Bedelia as Holly Gennero McClane. Alan Rickman as Hans Gruber. Poster for Lethal Weapon (1987), starring Mel Gibson and Danny Glover, directed by Richard Donner. Lethal Weapon (1988) stars Mel Gibson as Detective Martin Riggs and Danny Glover as Detective Roger Murtaugh, a mismatched pair of LA cops who uncover a plot laid by a former company of Black Operations soldiers, called Shadow Company, led by General Peter McAllister (Mitchell Ryan) and the ruthless Mr. Joshua (Gary Busey), to bring in a massive shipment of heroin from Vietnam just in time for the Christmas season. Riggs, a veteran of the Army Special Forces in the Vietnam War and loose-cannon who has recently lost his wife, and the aging family man Murtaugh, must put aside their difference to foil McAllister and Joshua’s villainous plans. Mel Gibson as Martin Riggs (Left) and Danny Glover as Roger Murtaugh (Right). Mitchell Ryan as General Peter McAllister (Left) and Gary Busey as Mr. Joshua (Right).